You found the best place for Buca Di Beppo menu prices. Bravissimo! Buca Di Beppo is the perfect spot to enjoy classic Italian dishes. Buca di Beppo offers diners family-style dishes in a vintage and eclectic setting. Buca di Beppo is a great location for family celebrations and group outings. Setting foot inside a Buca di Beppo location is like strolling along a street in Italy. The walls are full of vintage photos from the old country. Speakers in the restrooms deliver conversations of Italian speaking of men and women. Each Buca di Beppo location has a “Pope Table” that seats 12-18 people. Below are the latest Buca Di Beppo menu prices. Buca e-Club is a great way for fans to stay in touch with the newest dishes and receive the latest coupons and exclusive offers. Signing up is free and quick plus Buca will give you a free pasta dish for subscribing. Let Buca help cater your next event with classic Italian dishes. No matter the type of event or number of people, Buca can take care of all the details. With the help of Catering Specialists, Buca will cook, deliver, set-up, clean and provide all the utensils and dishes. No mess, no stress. Call your local Buca di Beppo location for more details. Hosting a party but don’t have the room? Check out Buca’s banquet halls or private rooms. Buca’s banquet rooms can host any occasion. With delicious menu options to choose from, guests can design a menu to meet their needs. Italian hospitality is always included. The first incarnation, Buca Little Italy, opened in Minneapolis in 1993. In 1998, it was renamed Buca di Beppo. 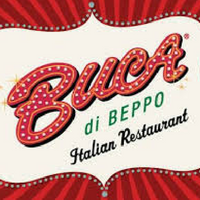 There are currently over 90 Buca di Beppo locations open in the US. Today, Buca di Beppo is a subsidiary of Planet Hollywood and is headquartered in Orlando, Florida. For more information about Buca Di Beppo locations and the latest updates, visit their official website. Does Buca di Beppo take reservations? Reservations are always welcome at Buca di Beppo. Guests can call or make a reservation online. Does Buca di Beppo offer take-out service? Yes, Buca di Beppo does offer its menu for take-out service. Does Buca di Beppo have gluten-free pasta? At the time of this writing, Buca di Beppo does not offer gluten-free pasta.